We arrived too late for the pool hours, didn’t join the bingo game and didn’t partake in the big breakfast being offered (for $5). When I got up, there was a haze moving across the sky. Looks like fires burning somewhere. We packed up and headed, the wrong way, on Hwy 1 because it was a controlled access and we had to ride downhill a mile or two to the U-turn site, and back up the hill. 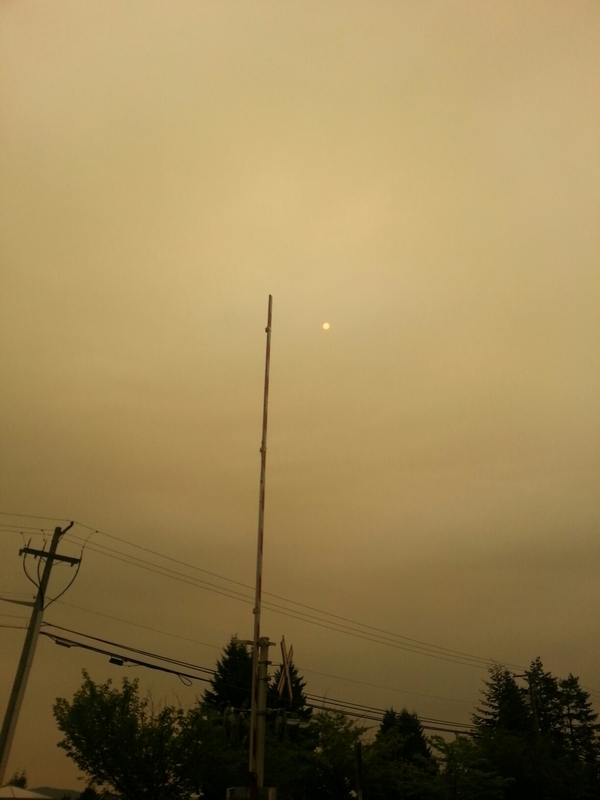 Once going towards Nanaimo, we could clearly see the haze, and a light ash began falling. That’s the sun at the top of the pole. Once again, Brian escaped death when an idiot in an RV passed and then turned right, on top of our whole line. I was at the rear and shouted that he was turning, Brian had to cut right to avoid getting crushed. We got to the ferry terminal an hour ahead of departure, enough time for a quick bite in the market and to board ahead of the cars which were lined up in five or six rows, twenty deep. Didn’t seem like the ferry could hold them all. But, then I realized there were several decks for cars, buses, RVs and motorcycles. An hour and forty for the crossing. 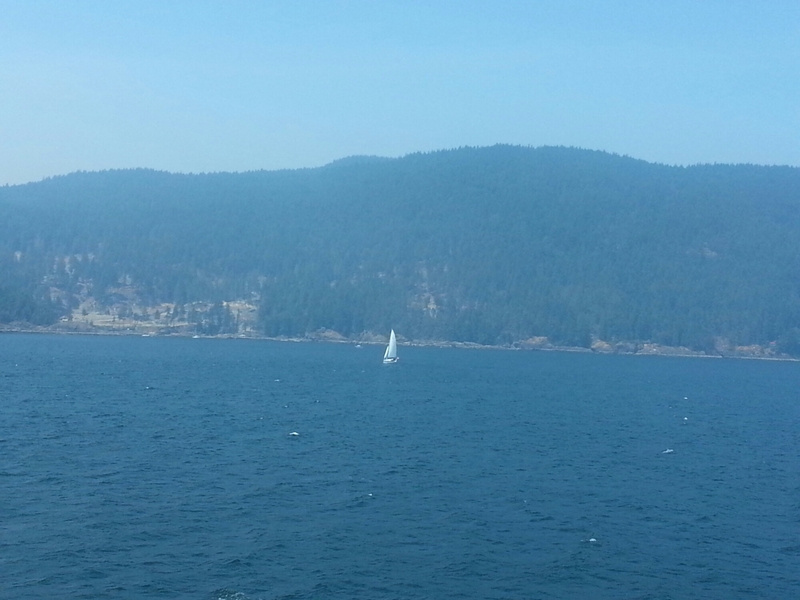 The Vancouver shoreline was also hazy. On the way to our hosts in West Vancouver, Bob’s bike started making a clicking sound. My analysis was rear bearings. He said he hasn’t done any maintenance on it (or pretty much the whole bike) in 5000 miles. We had to find a bike shop to look at it. The bike mechanic straightened his derailleur hanger, the away his rear wheel plastic spoke protector (but, surprisingly, left the reflector in the rear wheel spokes) and adjusted his rear cones, that seemed to fix the problem. We watched the US Women’s Soccer Team victory, yay, took a quick tour around town by car and had salmon for dinner. The fire haze may spoil the wonderful views in this spectacular city. We’re hoping for a wind shift. We’ll explore Vancouver tomorrow from our base in West Vancouver, sorry, Ryan, not coming your way. Then, Tuesday we’ll head towards the US and Seattle.